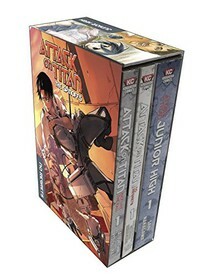 This box set contains the first volumes of the three spinoffs of Attack on Titan: Attack on Titan: No Regrets, Attack on Titan: Before the Fall, and Attack on Titan: Junior High! Humanity has learned to live in complacency behind its high walls, protected from the giant Titans. But when a Titan-worshipping cult opens one of the gates, a Titan wreaks havoc, consuming the cultists. After the rampage is over, two young Survey Corps members are shocked to discover a pregnant woman's partially digested corpse - with her baby still alive inside it! What will the fate of this "child of the Titans" be? And how will humanity learn to cope with the Titan threat? Eren and Mikasa enter a new school: Titan Junior High! However, Eren's hated Titans for years. Can he get along with his new "harmless" classmates? Featuring all of the characters from the main series as you've never seen them before, this series is sure to delight fans of Attack on Titan with a human vs. Titan volleyball match, a Titan rock band, and more! Story and art by Saki Nakagawa.